The South Skyline area is one place where the organism (Phytophthora ramorum) that causes Sudden Oak Death (SOD) has thrived. It escaped into native forests from ornamental plantings in the late 1980's-early 1990's in Santa Cruz County. Traveling via wind-blown raindrops, it made its way into our neighborhood thanks to the continuous forest cover and because of our suitable weather conditions and trees. Learn more at the links below and play a part in the continuing scientific investigation in our area. The 2015 "SOD Blitz" for South Skyline was held April 25. The first three links below contain follow-up information from this event. Link to 2015 SOD thank you letter. 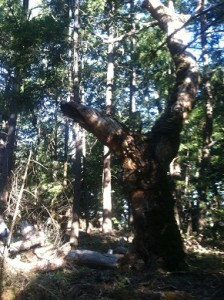 Link to a list of arborists for the SSA area. Link to article on the "SOD Blitz" as an example of successful citizen science. For more info, email skyline_sod@yahoo.com and for more info about SOD go to sodblitz.org. The primary researcher, Matteo Garbelotto, at UC Berkeley Forest Pathology and Mycology Lab, has this website area devoted to Sudden Oak Death and is a good place to start. Here is the link to the 2014 SOD Blitz results. South Skyline resident Larry Watson with editing support from Dr. Garbelotto wrote a Skylines article found on page 7 entitled "South Skyline Rainfall and Sudden Oak Death". Sudden Oak Death in our area has a big influence on surface fuel loads that support wildfires: SOD and fire loads_Doug-fir tanoak. The USDA has published a manual entitled "A Reference Manual for Managing Sudden Oak Death in California" (note this is a 12MB document): USFS_psw_gtr242. Avoiding SOD infection, treatment options, SOD carriers, and much more scientific information about SOD: suddenoakdeath.org.